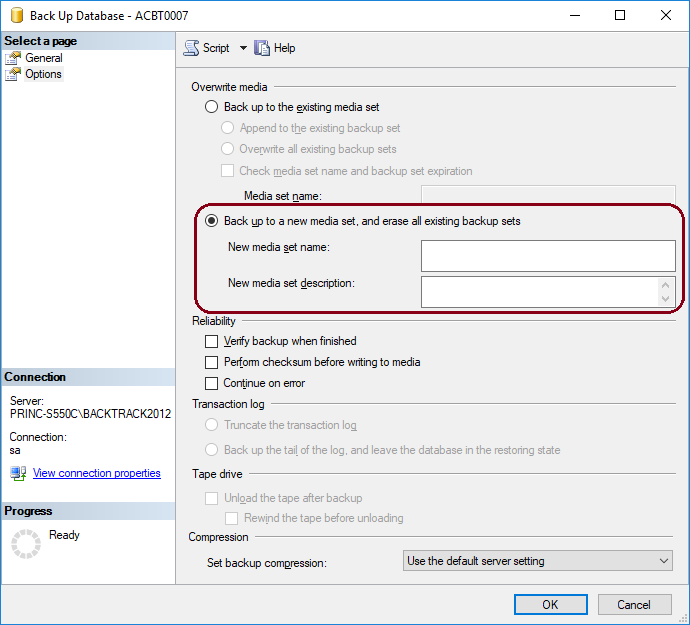 This Error Message Article explains the SQL Management Studio error message “Backup failed for Server ‘[server name]’. (Microsoft.SqlServer.SmoExztended) Additional information: System.Data.SqlCLient.SqlError: Cannot use the ‘[backup file and file location]’ because it was originally formatted with sector size [sector size] and is now on a device with sector size [sector size] (Microsoft.SqlServer.Smo)” and details how to fix the underlying problem that caused it to appear. A backup file is attempting to be saved over another existing backup file. When the message appears, the original file needs to be removed before the new file can be saved. This probably is due to some change in the original file where SQL does not recognize it as the old file. In the case where the message appeared, the database structure had been changed and it is possible a different version of SQL was used to generate the file. Either of those may have been the reason that SQL would not save the new backup over the old one. A good workaround is to select ‘backup to a new media set’. It seemed to solve the problem. In this situation, it was saving over a backup of a newer version of SQL.